When we think of a hectic schedule, we often think we have to do everything while on-the-go. But the truth is – we can knock out a lot of our tasks right from the comfort of our desk space. Having a neat, stationary area can help us maintain ourselves organized and keep us focused on the task at hand. power to smoothly surf the web and run programs. Visit your go-to sites using a browser and download your essential desktop applications from the Microsoft Store to get going. You can also create and save documents, check your e-mails, and so much more. The Byte3 is designed to make all of your personal computing easy. 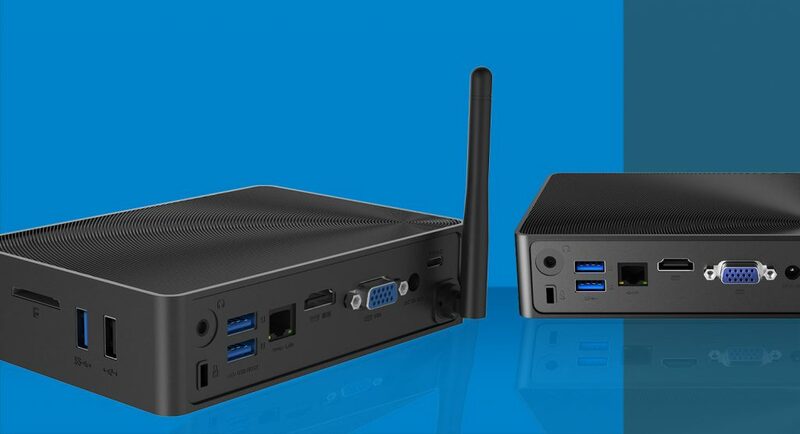 Being a fanless mini PC, the Byte3 will sit silently in the corner of your desk. This makes it the perfect alternative to typical desktop setups, which usually take up a lot of space with a loud and bulky tower computer. No worries of unsightly and cramped areas- this little device will work with you to make a more modernized and practical work space. Although small, the Byte3 doesn’t give any less usability or power than it’s larger competitors. It is purposefully designed with multiple ports and slots to give the ability to create your perfect setup. Use the audio jack to connect your headphones or speakers, the USB ports to connect your favorite accessories such as a keyboard, mouse, etc. and the HDMI port to connect your monitor. You can even connect a second monitor via the VGA port to create a dual monitor setup. If wires aren’t your thing – that’s ok too, just use the Bluetooth connectivity to pair your wireless accessories. The Byte3 proves that a personal desktop can be the perfect companion to get your personal tasks done efficiently and comfortably. You don’t need to spend so much to get the quality you need. While a good laptop may run you an average of 500+ , and may be kept stationary most of the time anyways – you can pick up a Byte3 starting at around $200. And the best part- considering its compact size, you can easily grab your Byte3 and go.